The finishing touch! Make these Oxygen Absorbing Bottle Caps your last line of defense against oxidation and eliminate your worry. These Oxygen Absorbing caps have a special liner that absorbs oxygen in the bottles headspace. This helps reduce the oxidation that happens during the bottling process, keeps your home brewed beer tasting fresher, and can extend it's shelf life. Important to note: These caps activate once you get them wet. Do not wet or sanitize caps in advance of your bottling session or they will not work correctly. They’ll still close the bottle like any other cap, but the oxygen-absorbing function will be used up. These are my standard cap. No issues, solid choice. Two weeks after priming and bottling, the bottles using these caps contain completely flat beer. Flip cap bottles are fine. Works great as a bottle cap, not sure if the oxy absorption makes any different (have read people swear by them). Had to try them, and they worked as a bottle cap. Ideal for bigger beers and aging. Prevents oxidation and off flavors, sealing in more ideal traits. My homebrew with these caps are slightly better. Remember, IPA's and anything under 7%abv will not keep long or age well. Author Joshua Bernstein has great advice on beer aging. Great for absorbing the 02 in the head-space of your freshly bottle brews! Caps work like a charm; no problems whatsoever. These caps probably make your beer better. I haven't tested these Oxygen Absorbing Bottle Caps against regular caps, but they probably prevent beer that's been sitting around too long from tasting stale. Why not give your beer it's best shot at tasting great. Plus, they're shiny. I like these because they absorb oxygen when wet and are inexpensive. I label my beer by writing on the caps with a industrial sharpie. I only use oxygen absorbing caps when I bottle. Why chance it? Ive never had a problem with oxidation in 16+ batches so far. Every beer has tasted fresh as can be. I was a bit doubtful about whether these caps would really change much, but figured I would give them a try. I liked the fact that they had the thicker inner seal as mentioned by a reviewer above. Also, we have found since using these that the incidence of having a slight estery or metallic smell that we would occasionally get when opening a bottle (even though the beer tasted fine) has really reduced. I'm not sure if I would have issues with my bottling process, but using these oxygen absorbing caps is inexpensive insurance. Never had a capping issue with these. What I use for my competition beers to avoid any chance of oxidation. Soak in some Star San right before you pop them on the bottle. Bought these for my second batch of bottled beer. I bottled a Belgian Pale with this caps and they seem to be aging better, with less oxidation, than regular caps. Will buy these again. I mostly keg but when I bottle I don't want oxidation issues. These hit the spot. ... but I use them anyway. Do not wet them before, or after, applying. I don't usually bottle, but when I do, I use these caps! I keg, but I use these caps when bottling for competitions. They work well! 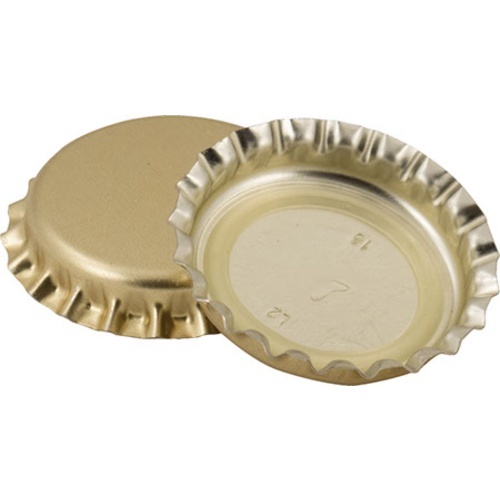 I would not feel safe sending a beer to a competition without using these caps to keep oxygen out. I have not had a oxidation comment on any entry since I started using these. The oxygen absorbing is a major plus; it takes away some of the concern of air in the head space of your bottles, especially if you are going to be traveling with your bottles (and therefor shaking them). Love these caps! Worth spending a little more so I don't have to worry about oxidation. 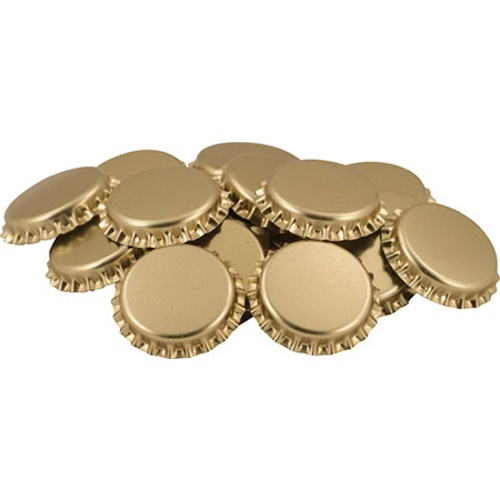 I love these for my cellared beers; I don't know how much the O2 absorbing actually helps, but I feel better using them. I haven't had any blow off, even in some bottle-bombs I've made, and they go on easily. I use these caps if I'm bottle carbing, or if I'm planning on aging in bottles for a long time. These work great at preserving the freshness and preventing oxidation. Make sure your beer gets to competition fresh! Both for long and short term storage, make sure you keep any and all O2 out of that bottle! I highly recommend these. Very high quality. Have never had any problems or issues with these caps. I keg most of the time. But when i decide to bottle a batch (or even just a few from the keg) i use these. I have noticed that the seal on the inside seems to be a hair thicker than some other cheaper caps i've used in the past... which is a good thing. But it makes capping some of the German bottles with a slightly heftier lip a little tricky using the red butterfly red capper. I use these caps exclusively. Some people say O2 caps are a waste of $, don't carb properly, etc. They are all I use and have never had a problem with them....EVER! Caps stay snug, work great; worth the little extra expense to ensure good beer. I use them exclusively, even though I use CP filler, just in case. Although they are a little more expensive these caps are worth it. Anytime I go through the trouble of brewing a beer its worth it to me to protect it from oxygen. And the air out. What more could I ask for?